Real Madrid welcome Atletico Madrid for the first leg of their Champions League semi-final on Tuesday hoping to do something that has been beyond the reigning 11-time European champions for six decades. Alfredo Di Stefano -- not Cristiano Ronaldo -- was Madrid's star man the last time Los Blancos won La Liga and Europe's top club prize in the same season. The eight times Real have been crowned champions of Europe since they have always done so happy to sacrifice La Liga for the tournament they see as defining their role as the biggest and best club in the world. "I won a Champions League with Madrid in a year in which we trained horribly," former Spanish international goalkeeper Santiago Canizares told radio station Cadena SER of the 1997/98 season. "There was very little commitment, but it was like there was psychological doping when we played in the Champions League. Everyone performed." Two years later he experienced the power of Madrid's commitment to the Champions League from the opposite side. "Then I lost a final with Valencia against Madrid in another horrible season for them. "They finished the league terribly, there were problems in the dressing room... and then they arrived in Paris and played us off the park." Even this season the lure of becoming the first side to successfully defend the Champions League has edged out that of ending Barcelona's dominance of La Liga. That has been evidenced by coach Zinedine Zidane's line-ups for a string of recent Liga games sandwiched between big European ties. None of Ronaldo, Gareth Bale, Karim Benzema, Luka Modric or Toni Kroos started any of Madrid's last three away games. In their absence the likes of Isco, Alvaro Morata and Marco Asensio have shone and Madrid won all three games, scoring 13 times in the process. Real have already played 53 games this season across five competitions and even two continents after travelling to Japan for the Club World Cup. Yet they remain on course for the most successful season in the club's storied recent history thanks to the depth of their resources. Which has thrown up a new dilemma: the performances of Madrid's youngsters have left question marks over whether a few star names deserve their place in the team for Tuesday's semi-final. Real smashed Deportivo la Coruna 6-2 on Wednesday with a team containing nine changes from the side that lost El Clasico to Barcelona days previously. Yet they laboured to beat Valencia 2-1 thanks to Marcelo's late strike when Zidane resorted to largely his preferred XI on Saturday. "For me, it is harder to play against Madrid's B team than their A team," said Deportivo boss Pepe Mel. Bale's absence through injury means that one of Isco or Asensio are likely to finally start one of Real's biggest games of the season this week. 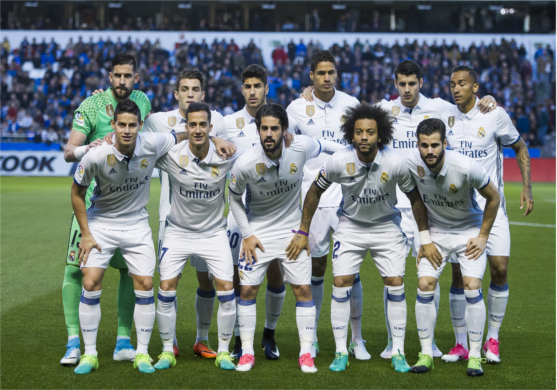 However, even for Real Madrid, a squad of this size and talent may be a one-season luxury. Isco, Morata and James Rodriguez have all been heavily linked with moves away from the Bernabeu in the summer due to their lack of game time. At 21 and 22 respectively, Asensio and Mateo Kovacic have the time to be more patient, but they too will expect to graduate to first-team regulars -- or find somewhere else where they will be.